If you need more space but cannot afford to move or you do not particularly want to space then why not make the most of the space literally beneath your feet! Your basement or cellar can offer that extra space you require without the job of getting in the removal vans, uprooting and moving elsewhere! Twistfix can supply all the products you would need to turn an empty, damp cellar or basement into a habitable living space, without the expense of employing expensive “conversion specialists “. We supply high quality basement Waterproofing membranes which are available for wall and floors and all types of plaster applications. Sump, pumps and drainage systems are available take care of any cavity or ground water and systems are available for removing foul waste from kitchens and bathrooms. All the membranes BS 8102 :1990 Type C compliant-water­pro­ofing tanking membrane for waterproofing wall and floor surfaces below ground-Grade 3 or 4 Dry Environment. This is a cavity drain membrane for tanking walls and waterproofing floors, the membrane leaves an impermeable waterproof surface enabling dry lining on studs and for direct lying on floors. An advantage of this membrane is mechanical and electrical services can be hidden between the timber studs and there is no need for chasing walls etc. Baseline mesh membrane is a waterproof mesh membrane for waterproofing and tanking basement walls it has a tough HDPE mesh surface for direct application of plaster. Ideal if you do not want to lose the space a timber frame will take off your basement. The Baseline 8 and the Baseline mesh membranes are available in kit form which includes all the necessary plugs, seals and waterproof tape. It is currently available in 40m2 and 48m2. To collect any water from the cavity membranes a basement sump pump and waterguard channelling should be used, Twistfix offer a variety of these systems to cover all uses including foul and waste water. 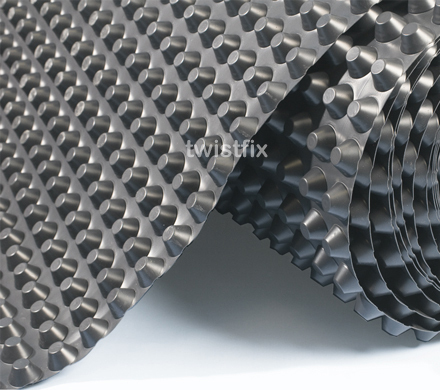 For more information on basement waterproofing please contact us on 0845 1236007 or email sales@twistfix.co.uk.